Gomez Amplification The Tahitian Reverb-Amp. Basically worked good but had some damaged power tubes in shipping. I think they were just left in the tube sockets when shipped and some got rattled loose and were rolling around inside the chassis and what not when it arrived. Two had broken guide pins and one did not work at all, but still had the guide pin. New power tube quad from the seller and it’s ready to go again. 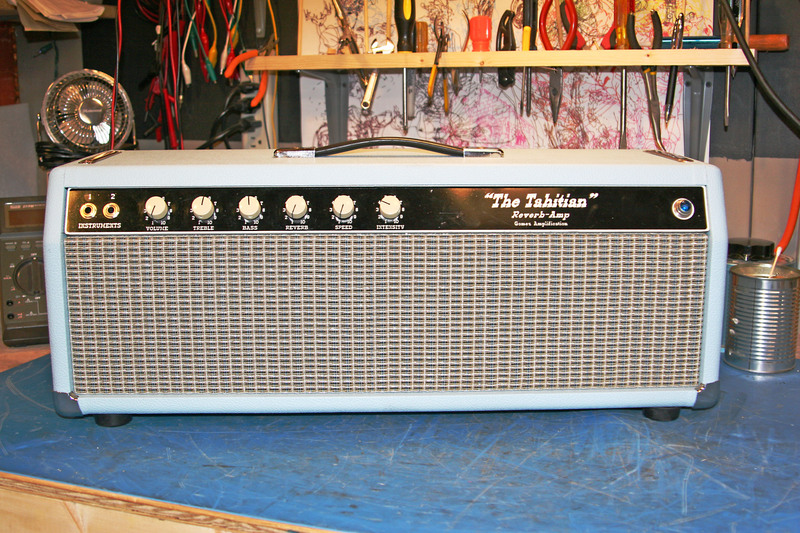 It’s essentially some sort of Fender derivative but they decided to go a little untraditional with a sky blue tolex, cool. Inside the chassis is what you’d expect based on the external look, eyelet board and lots of braided wire in the Fender style of build. Grounds are haphazardly mounted anywhere on the chassis that’s convenient which is not a good build technique but I guess it’s worked good enough for many old amps over the years, and even this one too. Noise floor is not offensive and the amp works fine/normal in that regard. Build is pretty rugged, probably a bit better than your typical vintage Fender I’d say. 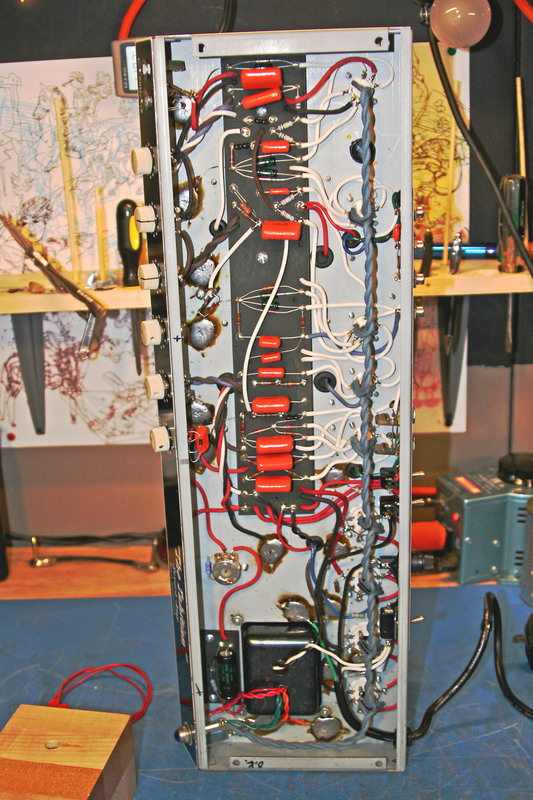 The tremolo circuit is the bias modulating style so when it’s in use the bias voltage for the power tubes varies up and down for an amplitude modulation in the sound. Since the bias voltage is varying there is a bit of distortion you can hear because it’s biasing the power tubes momentarily very cold into a crossover distortion territory. It’s pretty easy to view on an analog oscilloscope. Anyway, a slight drawback of this type of tremolo circuit but I guess it has a good sound that people appreciate in other ways. Here’s a little article I came across that talks about it — Bias Modulating “Tremolo” Circuits.